Erwin Rudolf Josef Alexander Schrödinger (August 12, 1887 – January 4, 1961) was an Austrian-Irish physicist who achieved fame for his contributions to quantum mechanics, especially the Schrödinger equation, for which he received the Nobel Prize in 1933. In 1935, after extensive correspondence with personal friend Albert Einstein, he proposed the Schrödinger's cat as an imaginary thought experiment to magnify the Copenhagen Interpretation of quantum experiments to the patent-absurdity of a cat that is both full-of-life and stone-cold-dead at the same time, in a supposition of states. Schrödinger in 1933, when he was awarded the Nobel Prize in Physics. Bust of Schrödinger, in the courtyard arcade of the main building, University of Vienna, Austria. In 1887, Schrödinger was born in Erdberg, Vienna, to Rudolf Schrödinger (cerecloth producer, botanist) and Georgine Emilia Brenda (daughter of Alexander Bauer, Professor of Chemistry, k.u.k. Technische Hochschule Vienna). His father was a Catholic and his mother was a Lutheran. In 1898, he attended the Akademisches Gymnasium. Between 1906 and 1910, Schrödinger studied in Vienna under Franz Serafin Exner (1849-1926) and Friedrich Hasenöhrl (1874-1915). He also conducted experimental work with Friedrich Kohlrausch. In 1911, Schrödinger became an assistant to Exner. 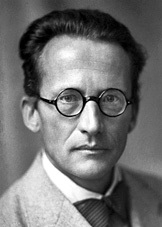 In 1914, Erwin Schrödinger achieved Habilitation (venia legendi). Between 1914 and 1918, he participated in war work as a commissioned officer in the Austrian fortress artillery (Gorizia, Duino, Sistiana, Prosecco, Vienna). On April 6, 1920, Schrödinger married Annemarie Bertel. The same year, he became the assistant to Max Wien, in Jena, and in September 1920, he attained the position of ao. Prof. (Ausserordentlicher Professor), roughly equivalent to Reader (UK) or associate professor (U.S.), in Stuttgart. In 1921, he became O. Prof. (Ordentlicher Professor, that is, full professor), in Breslau (now Wrocław, Poland). In 1918, he made up his mind to abandon physics for philosophy, but the city he had hoped to obtain a post in was ceded to Austria in the peace treaties ending World War I. Schrödinger, therefore, remained a physicist. In 1922, he attended the University of Zürich. In January 1926, Schrödinger published in the Annalen der Physik, the paper, "Quantisierung als Eigenwertproblem" (tr. Quantisation as an Eigenvalue Problem_ on wave mechanics and what is now known as the Schrödinger equation. In this paper, he gave a "derivation" of the wave equation for time independent systems, and showed that it gave the correct energy eigenvalues for the hydrogen-like atom. This paper has been universally celebrated as one of the most important achievements of the twentieth century, and created a revolution in quantum mechanics, and indeed of all physics and chemistry. A second paper was submitted just four weeks later that solved the quantum harmonic oscillator, the rigid rotor, and the diatomic molecule, and gives a new derivation of the Schrödinger equation. A third paper in May showed the equivalence of his approach to that of Heisenberg and gave the treatment of the Stark effect. A fourth paper in this most remarkable series showed how to treat problems in which the system changes with time, as in scattering problems. These papers were the central achievement of his career and were at once recognized as having great significance by the physics community. In 1927, he joined Max Planck at the Friedrich Wilhelm University in Berlin. In 1933, however, Schrödinger decided to leave Germany; he disliked the Nazis' antisemitism. He became a Fellow of Magdalen College at the University of Oxford. Soon after he arrived, he received the Nobel Prize together with Paul Adrien Maurice Dirac. His position at Oxford did not work out; his unconventional personal life (Schrödinger lived with two women) was not met with acceptance. In 1934, Schrödinger lectured at Princeton University; he was offered a permanent position there, but did not accept it. Again, his wish to set up house with his wife and his mistress may have posed a problem. He had the prospect of a position at the University of Edinburgh but visa delays occurred, and in the end he took up a position at the University of Graz in Austria in 1936. In 1938, after Hitler occupied Austria, Schrödinger had problems because of his flight from Germany in 1933 and his known opposition to Nazism. He issued a statement recanting this opposition. (He later regretted doing so, and he personally apologized to Einstein). However, this did not fully appease the new dispensation and the university dismissed him from his job for political unreliability. He suffered harassment and received instructions not to leave the country, but he and his wife fled to Italy. From there he went to visiting positions in Oxford and Ghent Universities. In 1940, he received an invitation to help establish an Institute for Advanced Studies in Dublin, Ireland. He became the Director of the School for Theoretical Physics and remained there for 17 years, during which time he became a naturalized Irish citizen. He wrote about 50 further publications on various topics, including his explorations of unified field theory. In 1944, he wrote What is Life? which contains a discussion of Negentropy and the concept of a complex molecule with the genetic code for living organisms. According to James D. Watson's memoir, DNA, The Secret of Life, Schrödinger's book gave Watson the inspiration to research the gene, which led to the discovery of the DNA double helix structure. Similarly, Francis Crick, in his autobiographical book What Mad Pursuit, described how he was influenced by Schrödinger's speculations about how genetic information might be stored in molecules. 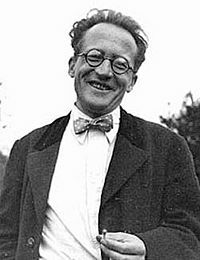 Schrödinger stayed in Dublin until retiring in 1955. During this time, he remained committed to his particular passion. Scandalous involvements with students occurred and he fathered two children by two different Irish women. He had a life-long interest in the Vedanta philosophy of Hinduism, which influenced his speculations at the close of What is Life? about the possibility that individual consciousness is only a manifestation of a unitary consciousness pervading the universe. In 1956, he returned to Vienna (chair ad personam). At an important lecture during the World Energy Conference, he refused to speak on nuclear energy because of his skepticism about it and gave a philosophical lecture instead. During this period, Schrödinger turned from mainstream quantum mechanics' definition of wave-particle duality and promoted the wave idea alone, causing much controversy. Schrödinger decided, in 1933, that he could not live in a country in which persecution of Jews had become a national policy. Alexander Frederick Lindemann, the head of physics at Oxford University, visited Germany in the spring of 1933, to try to arrange positions in England for some young Jewish scientists from Germany. He spoke to Schrödinger about posts for one of his assistants and was surprised to discover that Schrödinger himself was interested in leaving Germany. Schrödinger asked for a colleague, Arthur March, to be offered a post as his assistant. The request for March stemmed from Schrödinger's unconventional relationships with women. His relations with his wife had never been good and he had had many lovers with his wife's knowledge. Anny had her own lover for many years, Schrödinger's friend Hermann Weyl. Schrödinger asked for March to be his assistant because, at that time, he was in love with March's wife, Hilde. Many of the scientists who had left Germany spent the summer of 1933 in Alto Adige/Südtirol. Here, Hilde became pregnant with Schrödinger's child. On November 4, 1933, Schrödinger, his wife, and Hilde March arrived in Oxford. Schrödinger had been elected a fellow of Magdalen College. Soon after they arrived in Oxford, Schrödinger heard that, for his work on wave mechanics, he had been awarded the Nobel prize. In the spring of 1934, Schrödinger was invited to lecture at Princeton University and while there he was made an offer of a permanent position. On his return to Oxford, he negotiated about salary and pension conditions at Princeton but in the end he did not accept. It is thought that the fact that he wished to live at Princeton with Anny and Hilde both sharing the upbringing of his child was not found acceptable. The fact that Schrödinger openly had two wives, even if one of them was married to another man, was not well received in Oxford either. Nevertheless, his daughter, Ruth Georgie Erica was born there on May 30, 1934. On January 4, 1961, Schrödinger died in Vienna of tuberculosis at the age of 73. He left a widow, Anny (born Annamaria Bertel on Dec. 3, 1896, died Oct. 3, 1965), and was buried in Alpbach (Austria). In the quantum view, an atom is a quantum probability wave with the particles jittering about in it over time. Schrödinger's enduring contribution to the the development of science was to describe the atom in terms of the wave and particle aspects of the electron established by the pioneers of quantum mechanics. His insight, while derived by considering the electron, applies equally to the quarks and all other particles discovered after his time. 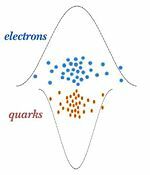 In particle physics, the electron, like all fundamental particles is a unified entity of wave and particle (or wave-particle duality). The wavefunction tells the particle what to do over time, while the interactions of the particle tell the wave how to develop and resonate. The wave aspect of the atomic electron is atom-size, while the particle aspect is point-like even at scales thousands of times smaller than the proton. The electron jitters so rapidly about in the wave that, over even fractions of a second, it behaves as a 'solid' cloud with the shape of the wave. Applying the classical wave equation to the electron, Schrödinger derived an equation—which now bears his name—that gave the shape of the wave and thus the shapes of the atoms. The wavefunction, unlike classical waves that can be measured with real numbers—is measured with complex numbers involving the square root of minus one. In English, his equation states that the negative rate of change in the value of the wavefunction at a point at a distance from the tiny central nucleus equals the product of 1. the value of the wavefunction at that point 2. the difference in total and potential energy at that point (called the action and 3. the inertia of the particle—its rest mass-energy. This requirement determines the shape of the wavefunction, or orbital, and hence the shape of the atom. where the Greek letter psi, ψ, is the complex value of the wavefunction at a distance from the nucleus, m is the mass, E is the total energy, V is the potential energy at that distance from the nucleus, and the h-bar squared—Planck's Constant divided by 2π—simply converts the mass and energy measured in human units—such as grams and ergs—into natural units. The electron density over time at any point equals the absolute square of the complex number value of the wavefunction, |ψ| , which is always a real number. While this equation, remarkably enough, explains everything about the nature of atoms, the current state of math is such that it can only be solved for the two simplest atoms, hydrogen and helium. Perturbation theory is used to generate approximate—and quite accurate—solutions for the more complex atoms. Max Born, one of the quantum founding-fathers, stated his opinion, in 1926, that: "The Schrödinger Equation enjoys in modern physics the same place as in classical physics do the equations derived by Newton, Lagrange, and Hamilton." Born's opinion of the legacy and fame was correct; the Schrödinger Equation is the very foundation of all atomic physics and chemistry. The huge Schrödinger crater on the far side of the Moon was posthumously named after him by the IAU. The Erwin Schrödinger International Institute for Mathematical Physics was established in Vienna in 1993. Schrödinger, Erwin. 1956. Expanding Universes. Cambridge: Cambridge University Press. Schrödinger, Erwin. 1946. What is Life?. New York: Macmillan. O'Connor, John J. and Edmund F. Robertson. Erwin Rudolf Josef Alexander Schrödinger. MacTutor archive. Biography from the Austrian Central Library for Physics. Encyclopaedia Britannica article on Erwin Schrodinger. Nobel Lectures, Physics 1922-1941. Erwin Schrödinger Biography. NobelPrize.org. Schrödinger Medal of the World Association of Theoretically Oriented Chemists (WATOC). Annotated bibliography for Erwin Schrodinger from the Alsos Digital Library for Nuclear Issues. Schrödinger and his interest in Hinduism.